Created the RADseq platform at CEES, UiO, Norway. Seminar at the Univeristy of Olso, Norway. 15/04/2015. Screening DNA methylation pattern in non-model species. Poster and invited talk (getting the SIBE prize for the best paper published in 2014) at the FISV2014 conference, Pisa, Italy. 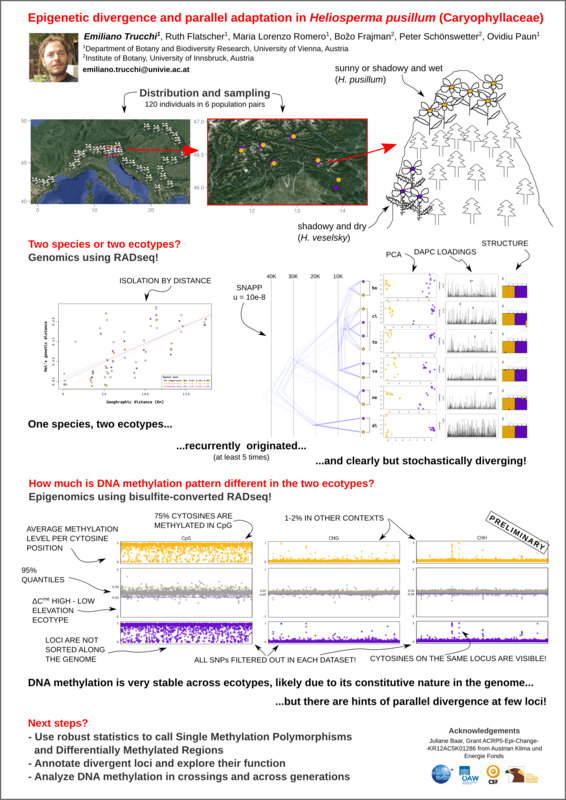 Talk at the GfOe2014 annual conference in the symposium "Epigenetics: the next big thing in ecology, or much ado about nothing? ", Hildesheim, Germany. Invited speaker at the ForBio Annual meeting. March 2013. Talk at the SMBE2013, Lisbon, Portugal (watch the video). Invited speaker at the University of Aarhus, Denmark. November 2013. Co-organizer and Teacher Assistant at the Workshop on Population and Speciation Genomics, Cesky Krumlov, Czech Republic. 25/01-06/02/2016. Organizing and teaching a 6-days course on RADseq data analysis for PhDs and postdocs at the University of Milan, Italy. Edolo, 6-12/06/2015. Teacher Assistant at the Workshop on Molecular Evolution, Cesky Krumlov, Czech Republic. 25/01-07/02/2015.